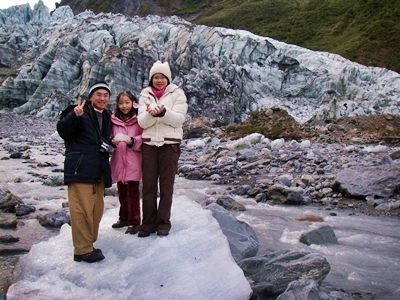 Operating out of Fox Glacier, this is an informative and leisurely trip to the dynamic face of the glacier. It is here that the Fox River emerges from the ice and where ice collapses are often heard and seen. This trip is for people with limited time or for those who would find the walks onto the glacier too strenuous. Although you will not walk on the glacier your guide will take you to the final resting place of the ice that has travelled 13 kilometres from the base of the Southern Alps, all the way to the river valley floor. Your guide may take you closer to the ice than the unguided public (if it is safe to do so at the time) and you will have the opportunity to learn the role of the Fox Glacier in shaping its environment. This two hour trip is reasonably easy going. About one and a half hours is spent walking over gentle terrain, over a river valley floor, at a speed that almost anyone can manage. There is a strong focus on providing you with quality interpretation so you can learn about the glacier and the surrounding environment. It is usually possible to view the cave at the terminal face of the ice from which the Fox River emerges. Maximum guide to customer ratio is 1:18. We require a minimum of 2 people for this trip to go ahead.